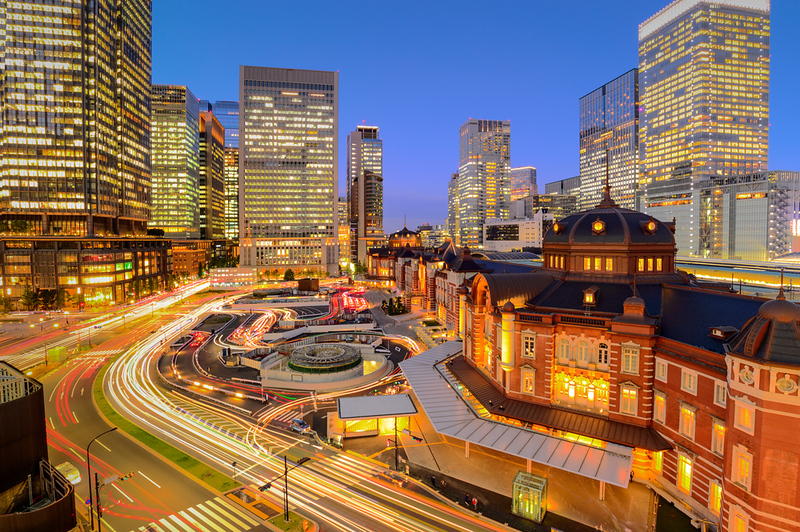 The Tokyo Station and Marunouchi District is more than just the gateway to Tokyo: It's a thriving urban hub in its own right, with great shopping, dining, and some top hotels. There are even some excellent museums and galleries. For many travellers, Tokyo Station will be their entry point to Tokyo and their first experience of a Japanese city. Once you make your way out of the sprawling maze of the station, you'll be pleasantly surprised to find the surrounding neighborhood to be attractive and easy to navigate. The area between the north side of the station and the Imperial Palace is known as Marunouchi. This area feels a bit like Midtown Manhattan and is home to some of Japan's most powerful companies and banks. This is an area of wide boulevards, well-dressed businesspeople and good restaurants. South of the station, you'll find a neighborhood thick with restaurants, department stores, smaller shops, hotels and bars – in short, everything that a traveler might need or want. Tokyo Station City produces an excellent downloadable PDF map of the station, along with a point and speak communication sheet and a map of the Tokyo Station/Marunouchi area (just note that this last one is printed upside down, with south at the top of the map). I recommend printing this out before arriving in Japan. There are several worthwhile things to do right near the station. These are listed in order of preference. This superb museum is my pick for the best attraction near Tokyo Station. It's one of my favorite art museums in Tokyo. Located in a recreation of the original 1894 Western-style office building, the museum has a permanent collection of paintings by Toulouse-Lautrec. But, the focus is on the superb special exhibitions held throughout the year, mostly focusing on Western traditional art, but with occasional excellent shows of Japanese art. It's expensive but well worth it. Nearby, you'll find a few good places for lunch. Hidden away on the 9th floor of an office building at the southern edge of Marunouchi, this fine little museum has a collection centered on Japanese paintings and East Asian ceramics. It's best for serious fans of this kind of art, rather than a general audience. The museum has a pleasant rest area with free tea that offers a sweeping view over the Imperial Palace where you can relax after touring the exhibits. It might be strange to list a train station as an attraction, but when the train station is like a small city, packed with shops and restaurants, it's worth including. You can buy all kinds of souvenirs in the Tokyo Station Ichiban Gai (First Avenue Tokyo Station) shopping/dining arcade, which is located directly downstairs of the main Yaesu Gate. For places to eat in the station, see the Tokyo Station entry below under Places to Eat. This fine museum of Western and Japanese art located a short walk southwest of the station is closed for reconstruction. It is scheduled to reopen in a few years. Check the website for details. This is one of my favorite buildings in Tokyo: It looks like a giant glass ship marooned in the middle of Tokyo. There's not much to do here, but it's well worth a walk through on the way to Ginza or Yurakucho. There are so many restaurants in and around Tokyo Station that it boggles the mind. Just remember that this is a working area and most of the restaurants will be packed with office workers during lunchtime – try to eat lunch before noon or after 1pm. In addition to the Kitchen Street dining area in Kyoto Station itself (see below), you'll find some of the best collections of restaurants in the large office buildings on the Marunouchi side of the station, including the Shin-Marunouchi Building, Marunouchi Building and the JP Tower Kitte Building. There are several dining areas in the station; my favorite is Kitchen Street, which is located on the ground floor at the northern end of the station (follow signs for the Nihombashi Gate). This food court has some really good restaurants and it's less hectic than the excellent but crowded Tokyo Station Ichiban Gai (First Avenue Tokyo Station) shopping/restaurant street, which is directly downstairs under the main Yaesu Gate. This arcade contains the popular Tokyo Ramen Street. I love this simple and approachable sushi restaurant in the Kitchen Street dining area in Kyoto Station (see mention above). You can get a great sushi set for about Y1,500. This would cost US$150 back home and it wouldn't be as good! I try to eat here every time I pass through Tokyo Station. Located in the excellent Marunouchi Brick Square shopping and dining complex, this branch of the popular Ippudo ramen chain serves a mouth watering bowl of ramen. It's highly recommended. It's very close to the Mitsubishi Ichigokan Museum. On the 6th floor of the Kitte Building, just 100m southwest of Tokyo Station (take the Marunouchi South Exit), this excellent upscale izakaya serves great Hokkaido cuisine and sake. They also do lunch. This restaurant near the Nihombashi Gate of Tokyo Station serves upscale yakitori. Some say it's overpriced. That may be the case, but it's tasty. It's on the B1 floor of the Iiyo!! dining complex. This low-key izakaya near the Nihombashi Gate of Tokyo Station is a good place for some beer, sake and hearty Japanese fare. It's a great choice for a casual dinner near the station. It's on the B1 floor of the Iiyo!! dining complex. Located in the Kitamachi dining area inside Tokyo Station, this Akita sake specialist is a must for sake lovers. There are tasting flights and some great yakitori to go with it. Highly recommended. Located at the front of Tokyo Ramen Street, on the B1 floor of the Yaesu side of Tokyo Station (inside the Ichiban Gai/First Avenue Tokyo Station arcade), this wildly popular ramen joint specializes in tsukemen (the noodles come separately and you dip them in the soup). It's great but it's often packed. But don't despair: just keep walking down Tokyo Ramen Street and find a place with empty seats. On the north side of Ginza, this Indian restaurant does fantastic sets and a la carte dishes of all the standard favorites. It's well worth the trip if you need a break from Japanese – just keep in mind that it's very popular. Go outside of peak hours. If you've got a craving for European-style pastries and cakes, head to this sublime shop on the edge of Ginza. The sweets here are works of art. They're not cheap, but they're absolutely delicious! Fancy some sky-high fine dining around Tokyo Station? Head to the 35th and 36th floors of the Marunouchi Building for a meal there - or just check out the free lounge. Marunouchi House in the Marunouchi Building has a 7th floor outdoor terrace where you can enjoy glorious, unfettered views of Tokyo Station while enjoying a delicious meal from one of the restaurants. It’s well worth checking out if you’re in the vicinity. Tokyo Ramen Street in the belly of Tokyo Station is home to eight of the nation’s best slurps, all in a single corridor. Your only problem is deciding which one to eat - and which queue to brave. Looking for a tasty vegan bowl of noodles while in Tokyo Station? Then look no further than T’s Tantan Ramen for a delicious and spicy meal. Soba restaurant Suju Masayuki Raku near Tokyo Station doesn’t go in for refined slurps. It’s not to everyone’s taste, but their rustic, unabashedly hearty noodle bowls are sure to win some folks over. Think ramen’s all meat and fish? Think again. Whether you’re vegetarian or not, the vegetable noodle bowls at Soranoiro NIPPON in Tokyo Station’s Ramen Street are sure to steal your heart. Even with hundreds of lunch options around Tokyo Station, Ippei is a clear favorite with many office workers in the area. Hearty, solid, inexpensive set lunches of Japanese favourites that arrive within 5 minutes - what’s not to like? If you’re pressed for time but still want decent sushi, skip the conveyor belt chain restaurants and come over to Yoshinozushi Honten in Nihonbashi. Their reasonably-priced lunch nigiri sets put the fast in fast food. Dominica’s soup curry is a fine example of the genre - spicy and hearty, generously portioned with meat and vegetables in equal measure. It’s no wonder this Kyobashi restaurant is so popular with local office workers! Arguably the best hotel in Tokyo, the Mandarin Oriental gets everything right. It’s true luxury. And, the location in Nihombashi is relatively convenient. The Peninsula is always in the running to be Tokyo’s best hotel. It’s a supremely comfortable and elegant place to stay and the location is good. An island of luxury in the sky with beautiful Japanese design, a great pool and a superb spa, the Aman is a great hotel. And, it’s an easy walk to/from Tokyo Station. A classic Japanese luxury hotel with gracious Japanese service that overlooks the Imperial Palace. The rates here are significantly lower than at the above places. With arguably the best location of any hotel in Tokyo, the Shangri La is a super hotel. And, the rates are much more affordable than at other luxury hotels in the city. Located inside the Tokyo Station building, this fine hotel has large comfortable rooms and some nice restaurants. And it’s much cheaper than others in this bracket. Overlooking Tokyo Station, this small boutique-style luxury hotel is an intimate and comfortable place to stay. Arguably the best mid-range hotel in Tokyo, this place gets everything right. And, it’s directly across the street from Tokyo Station. In a great location overlooking Tokyo Station, this elegant and stylish hotel is a step up from most mid-range hotels in Tokyo. With very reasonable rates and a super convenient location close to the station, this is a great economical choice at the low end of this price bracket. A short walk from Tokyo Station, this hotel offers small and stylish rooms with clean and spare design. Up in Nihombashi, but still within walking distance of Tokyo Station, this is a decent business hotel with very reasonable rates. This basic business hotel is about 10 minutes’ walk from Tokyo Station. It’s a good value. This is my second favorite bookstore in Tokyo (after the Kinokuniya in Shinjuku). There's a decent selection of English books on the 4th floor and a good café on the 3rd floor. Japanese cooking knives are works of art and this is the place to get them. This is one of the best souvenirs to bring back from Japan and a great gift for a cook. Just don't forget to put them in your checked baggage! This tiny little lacquerware shop on the edge of Nihombashi is one of my favorite shops in all Tokyo. Japanese lacquerware is sublime and this is a great place to buy a piece to bring home. You can even buy lacquerware iPhone cases. The grande dame of Tokyo department stores, this sumptuous old-line department store in Nihombashi is well worth checking out even if you don't intend to shop. Whatever you do, don't miss the food floor! If you're a fan of Japanese characters and all things kawaii (cute) take a stroll through the shops of this arcade off of the Ichiban Gai/First Avenue Tokyo Station shopping arcade on the B1 floor of the Yaesu side of Tokyo Station. This fine department towers over the Yaesu side of Tokyo Station. You can find all manner of great gifts and goods here. The B1 food floor is a great place to buy some high-end takeaway food to bring on the bullet train. And the collection of sweet shops on the ground floor is awesome. This branch of Kyoto's famous green tea shop is a fantastic place to buy some fine tea to bring home as a gift or souvenir. And the attached café is a fine place to sample some of the good stuff prepared the right way. This underground shopping arcade on the Yaesu side of Tokyo Station is a cut above most of the arcade inside the station itself. It's a great place to buy a special gift before heading home. In addition to these two craft beer pubs, consider visiting one of the izakayas in the Places to Eat section above. Specializing in Swan Lake brews but serving a wide variety of other microbrews, this is a great spot for the beer lover. Just keep in mind there's a Y300 cover charge. It's in Kyobashi, near Ginza. This hole-in-the-wall beer specialist serves about 10 kinds of Japanese microbrews and some tasty food. The prices are cheaper here than at other similar places in Tokyo. It's in Kyobashi, near Ginza.